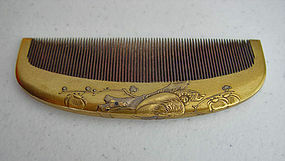 Japanese hair comb decorated with a pair of love birds, Oshidori (Mandarin ducks) perched on a plum tree, raised gold makie with silver, kirikin and shells. The theme here is auspicious. We counted 33 teeth in 3 cm, amazingly skillful hand work. Excellent condition - actual color loss in the center area of wooden teeth is not so obvious as shown in the photos. Circa, Meiji period (1868-1912) Dimensions: 3 1/4" x 1 1/8"